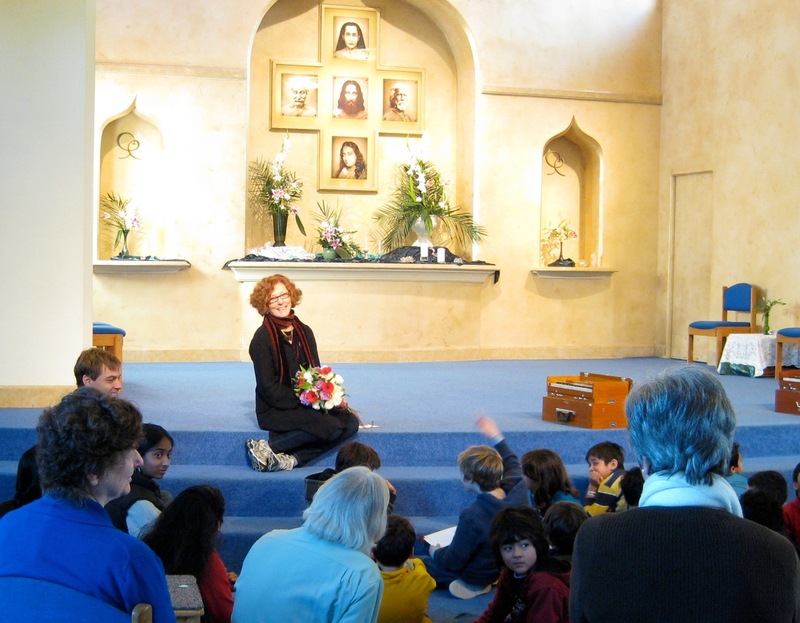 Barbara Rabin, the founding teacher of the Living Wisdom School in Palo Alto, has been a guiding force there for the past 19 years. On Wednesday the school family came together to celebrate Barbara as she prepares to embark on a new and wonderful chapter in her life. She will be dearly missed by everyone whose lives she has touched. Thank you, Barbara, for your many years of dedicated service to the children and families at Living Wisdom School! The celebrations for our guru's 118th birthday began on Wednesday evening with a group meditation in the temple. Asha reminded us of what she tells the children at the Christmas service: Jesus, Yogananda, and other masters already have everything they could possibly want, except for our love and devotion. So what else would we give them on their birthdays? She also gave us the sweet image of Master peeking into our hearts as we meditate, and exclaiming with childlike delight, "Oh boy! It's just what I wanted!" 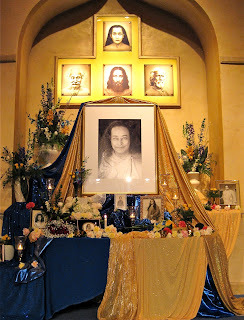 This week's altar in the temple. That birthday delight combined with a deep meditation really seemed to set the tone for the evening. One of the fascinating things about being at Ananda is how there can be such a strong feeling of joy, even with everyone just sitting around calmly. There were one or two times when I felt practically ready to laugh out loud, for no obvious reason, just in the middle of a prayer or a meditation. Asha gave an excellent talk on attunement to the guru and dedication to whatever expression of the Divine ray we have each been drawn to. At such a lovely event, it's certainly not hard to feel blissfully grateful for our particular Ananda ray. courtesy of the Sunday School kids. On Saturday we had our birthday retreat, which had a new format this year. It was structured in 4 segments, each one beginning with 10-15 minutes of a recording from one of Master's Sunday sermons (so that we heard the entire thing by the end of the day). After that, we focused on attuning ourselves with a particular quality of Master's: courage, positive thinking, even-mindedness, and God remembrance. Asha read from and commented on selections from Swamiji's The New Path, and Affirmation for Self-Healing that related to each one, and we listened to several songs that expressed each quality. The music led us into a period of meditation to absorb all this before coming around to the next segment. The birthday retreat marks the end of our major holiday season with about 22 events between Thanksgiving and now. As Asha pointed out at Sunday Service, the retreat is an excellent way to wrap it all up. We get a chance to pull back from all the busy-ness and be more inward for a day, and really integrate all the joy and inspiration we've received over the last couple of months. May we all carry that forward into a beautiful 2011. Jai guru, and happy birthday to all! Hopefully you've heard that we're switching back to our standard Sunday Service schedule beginning this weekend. This means we'll have the Fire Ceremony and Purification Ceremony at 9:00, and service at 10:00, complete with affirmation and the full Festival of Light. This happens to be a particularly appropriate time for the Purification Ceremony to be making its return. It's the beginning of the year, people everywhere are making New Year's resolutions, and there's a great deal of energy for change in the air. New habits will be made and old ones broken, with various degrees of success, but by February many of these resolutions will be forgotten. After that, it becomes all too easy to slip into another rut for the next 11 months. The Purification Ceremony, however, gives us a beautiful tool for tackling our resolutions. Its greatest power comes from how it leads us to greater attunement with our guru, who tells us (speaking through a Lightbearer) "open your heart to me, and I will enter and take charge of your life." Our goals and obstacles may seem overwhelming at our level of consciousness, but we know that God and guru can do anything through us if we let them. This can be a great comfort the next day, when we find ourselves faced once more with whatever issue we may be trying to let go of. We can simply turn inward for a moment and say "Master? This is the project we're working on this week, so let's just take care of it together, okay?" If we make a habit of going to purification every week, then we'll find ourselves keeping some of this new-year, changing, progressive energy going throughout the year. If a larger change isn't something we can accomplish in a single week, we can simply look forward to chipping away at it again the next week. Or we can focus on something else for a bit, and come around to the big issues again later. The point is that it keeps us moving forward, but in "bite-sized," achievable steps from wherever we are right now. So please, join us Sunday morning, bring your "new week's resolution," and we'll all grow joyfully together in increased attunement to Master. Happy New Year! Once again we were blessed to have the enthusiastic, energetic help of many great souls for our annual inventory and cleaning day at East West [on Monday]. The store is not only bright, shiny and magnetic as a result, we are already seeing an uptick in traffic and sales. Our heartfelt thanks to Dambara, Manisha, Asha and David, Nirmoha, Julia, Shanti, Ramani, Kristina, Kripamayi, and Chidambar. And to our wonderful staff led by Santosh, our outstanding workday coordinator. It was a day of joyful service and satsang.